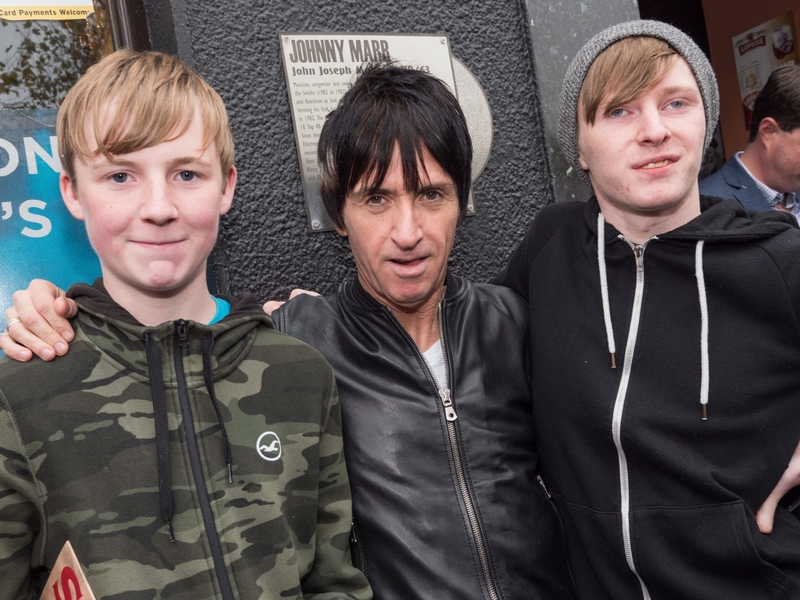 The Smiths' guitarist, Johnny Marr got a warm welcome in Athy as a special plaque was unveiled in Emily Square today. He dedicated the honour to his family on both sides - the Mahers on his Dad’s side and the Doyles on his mother’s. A 120 plus strong crowd showed gathered at Anderson’s pub to greet the guitar legend, considered to be one of the greatest of all time. 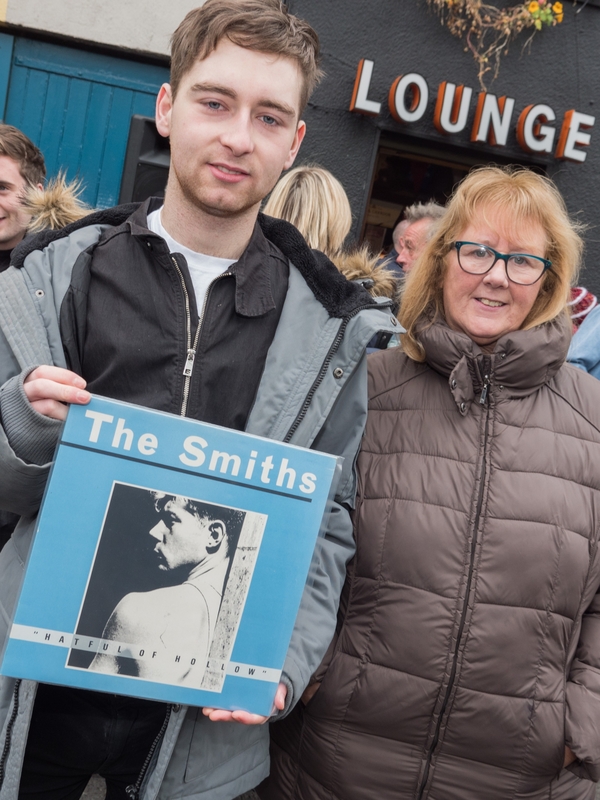 The bitter cold was no match for the fans, several of whom had travelled from far outside Athy and even Kildare to be there, many clutching their prized Smiths albums. Marr arrived at about 1.15, prompting applause and a reasonably dignified scrum. He was ushered into Anderson’s for a few moment where he met with family and friends. It was a warm reunion for all concerned. Presumably he meant the guitar. Despite the formalities, the event had a very warm and informal feel to it. There was a strong sense that, big and all a star as he may be, Johnny Marr is no stranger to these parts. 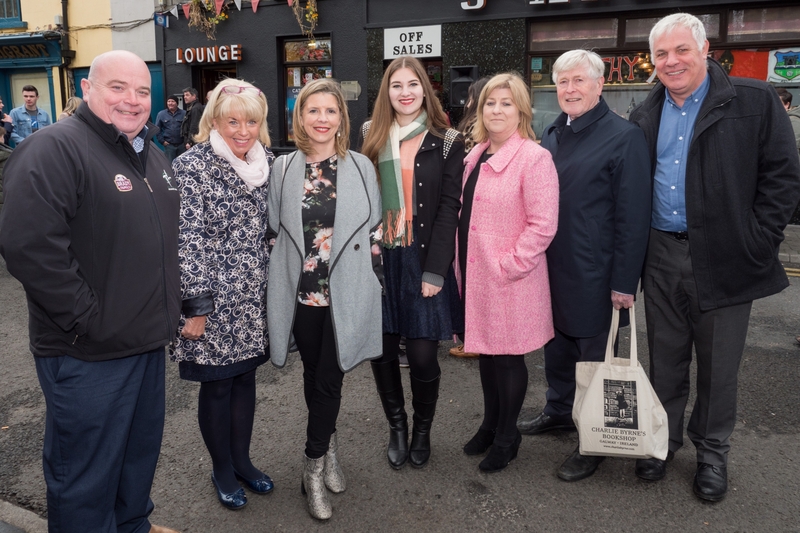 Dressed casually in a black jacket and his now trademark haircut, he was introduced by the Cathoirleach of Athy Municipal District Cllr Aoife Breslin said the town was “very very proud” of him. Reflecting and acknowledging the violent death of David Boland only a few days previously she offered her sympathies to the deceased man’s family, but said that the tragedy should not “take from what Athy is and what a great place it is”. She paid tribute to local man Colm Walsh who developed the concept the Made in Athy plaques. "This is a whole concept that we’re rolling out,” she said. “And if you look at the plaques we’re going to unveil, we have such talent that has come from this little area, and we’re so so proud of it. “Johnny, it’s great to have you in Athy. Please come more often. You’re more than welcome! “John Anderson (of Anderson’s bar) says that free drink is the order of the day for you. I’ve never seen that happen before, and I’ve been drinking here for a while. Thanks to Andersons for letting us put up the plaque here. Mr Marr began his small speech by acknowledging the tragedy a few days previously. He said that Athy was in his DNA, and that he believed it was the reason he was a musician. He said he was particularly proud of his roots in Athy and equally proud with the honour of the plaque, which he dedicated to the Maher and Doyle families.